This charming classic cardigan will soon become one of your favorites! It's a bit hard to see in the photo, but the hem of the body and sleeves are embellished with a diamond eyelet lace pattern. 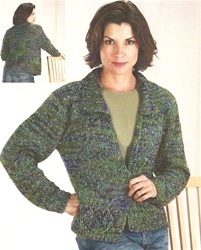 Dune's variegated colors and changing textures make this cardigan so versatile--wear it to the office, or with jeans! Five sizes S - M - L - X- 1X with finished bust measurements of 34" (37, 40, 43, 46") take 8 (10, 12, 14, 16) 50g balls of Dune. See the colors of Dune here.